The banks of the river Sar. Through the branches all around. But of love there, only love. “Don’t stay here any more. Get on with you on your way. This poem is by Johan Arias de Santiago, a troubador poet working in the court of Alfonso X the Wise around the year 1270. A native of Santiago de Compostela he was writing at a time when Gallego was the courtly language of Christian Spain. This shows typical features of the Provenzal tradition of love poetry with a local flavour. The unrequited lover with his ideal and courtly love of the distant lady is here replaced by a very real, if still unrequited, love for a peasant girl. The sense of place is vivid. It is worth noting that Rosalía de Castro’s last book of verse was titled ‘On the Banks of the River Sar‘. Martín Codax gives his name to a fine Albariño wine. Dear God, will he come soon? Waves of the wind-blown sea. The one I am sighing for? Who has me so worried? Martín Codax wine is made in the south of Galicia in the pretty seaside town of Cambados, not far from Vigo. Martín Codax was a mid 13th century to early 14th century Galician troubador, possibly from Vigo, we guess from the many references to the city in his poems. There are scarcely any records of his life. 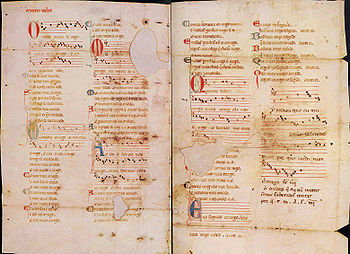 There are only seven cantigas de amigo attributed to him which are to be found in the old Galician-Portuguese songbooks and the Vindel Manuscript where his name appears as the author of the works. This is his entire oeuvre. The discovery of this manuscript was pure chance. In 1914 the bibliographer Pedro vindel found it in his library where it was the inner frontispiece of a copy of Cicero’s De Officiis. Thanks to the manuscript the musical notation of these compositions survives as well. If you are interested in old music it is well worth looking up Jordi Savall and Eduardo Paniagua on Youtube. It will inevitably lead you on a treasure hunt! Try looking at Alia Vox for more information on Savall. This entry was posted in Trobadores and tagged Alia Vox, Cresente, Galicia, Gallego, Johan Arias de Santiago, Jordi Savall, Martín Codax, poetry, Rosalía, Travel, troubador. Bookmark the permalink.